PPSC Jobs 2017: Punjab Public Service Commission Lahore is inviting applications from eligible candidates for 22+ Vacancies of Stenographers, Engineering, Finance, IT, Multimedia and Other Staff at Agriculture Department, Chief Minister’s Office Punjab, Information & Culture Department and Special Education Department of Punjab Government. Required qualification from a recognized institution, relevant work experience and age limit requirement are as following. Eligible candidates are encouraged to apply to the post in prescribed manner. Incomplete, late, hand written submissions/applications will not be entertained. Only shortlisted candidates will be called for written test/interview. See the notification below to see vacancies/positions available, eligibility criteria and other requirements. Eligible candidates can submit applications On-line on or before 28th April 2017. 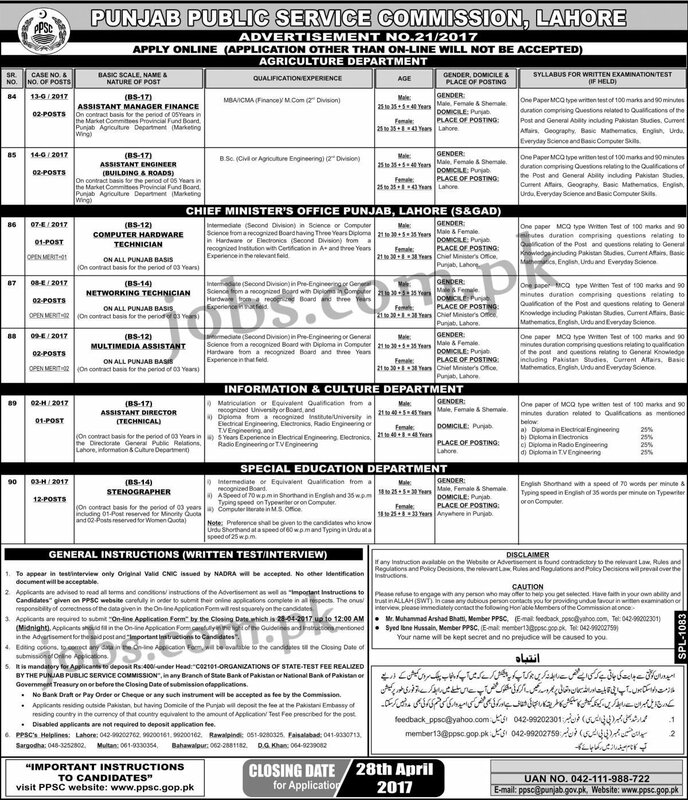 A total of 22 following vacancies are available at Agriculture Department, Chief Minister’s Office Punjab, Information & Culture Department and Special Education Department of Punjab Government. MBA / CMA, BSc, Intermediate, Matric. Please see job notification below for complete details. Interested candidates should submit their application form online only on PPSC website before the deadline of 28th April. For complete instructions about documents requirement and how to apply, please see the job notification given below.